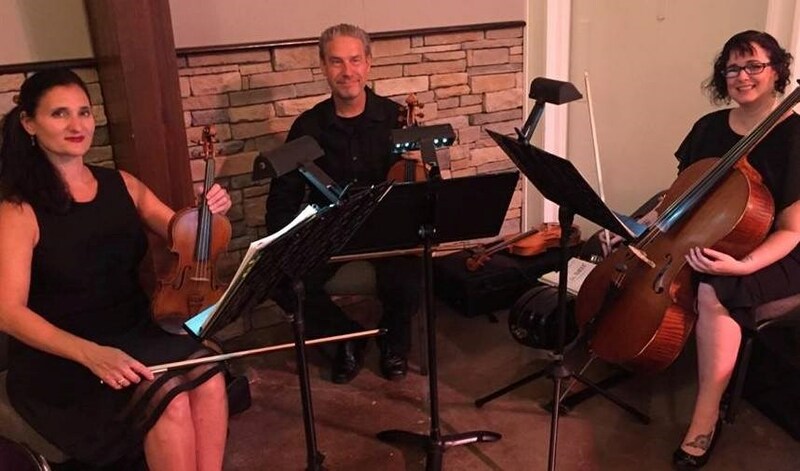 Simpatico Trio and String Quartet consists of Terry Pollak, Violinist/Violist, Karen Naifeh Harmon, Violinist and Amanda Hardy, Cellist, with Missy Townsend joining on Viola when we perform as a String Quartet. Review from a recent wedding: From the bride: "Everyone loved the music. They said you all were fantastic! I wish I would have been able to hear more. Thank you so much for making our day amazing!" Also from Emily: "You made it so beautiful for us and the best touch we could have had to the best day of our lives!! Thank you for helping make it so special for us!" Terry Pollak is equally fabulous on violin as he is on viola. Terry performs on viola with the Tulsa Symphony Orchestra as well as the Signature Symphony and he is formerly with the Jacksonville Symphony. Terry teaches violin and viola at the Barthelmes Conservatory in Tulsa. Terry has his teacher certification from attending the University of Oklahoma and attended Graduate School at Southern Methodist University. Karen co-conducts the Tulsa Honors Orchestra. Karen is a Nationally Certified Teacher of Violin and is a member of the Suzuki Association of the Americas, Hyechka Music Club of Tulsa, and the Tulsa Accredited Music Teachers Association. Karen also performs with an Irish Folk/Rock band, Larkin, and has opened for acts such as Bugs Henderson, the Legendary Shack Shakers, and Loretta Lynn. Karen is currently working on a Masters Certificate from the renowned Berklee School of Music in Composition for Film and TV. Her newest composition “The Red Velvet Suite” will be performed by the Sydney Contemporary Orchestra in Sydney, Australia. Simpatico Trio performs at many venues including the Mayo Hotel, Philbrook Museum, Gilcrease Museum, the Tulsa Garden Center and the Center of the Universe. 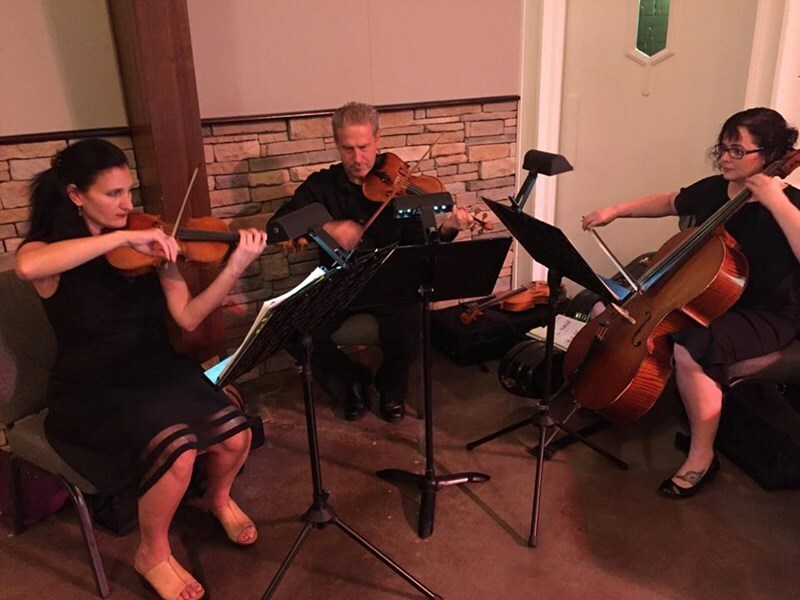 Definitely recommend the Simpatico Trio - Karen was very kind in all of our interactions and their beautiful music added so much elegance to my daughter's wedding ceremony. I hired the Trio for my wedding and they were awesome. I didn't have to worry about anything. They were shown where to set up and they handled it all from there. I even requested specific music and they were very accommodating. I will recommend them for future events. They were amazing! And they rolled with all the craziness and last minute changes that was our wedding! They were very professional and I would recommend them to anyone! It was our pleasure to be there for your special day! Please note Simpatico Trio will also travel to Jenks, Broken Arrow, Oakhurst, Glenpool, Bixby, Kiefer, Leonard, Sapulpa, Catoosa, Mounds, Sand Springs, Coweta, Owasso, Sperry, Beggs, Kellyville, Collinsville, Haskell, Redbird, Skiatook, Inola, Prue, Claremore, Mannford, Preston, Porter, Slick, Vera, Morris, Oologah.